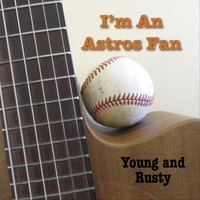 Austin singing duo Sue Young and Rusty Nelson just put out this great song, "I'm an Astros fan." It was written by life long Astros fan Rusty Nelson for all Astros fans who have suffered through so many years of disappointment before the ultimate dream filling exhilaration in 2017 of a World Series Championship. Sue Young, who "jumped on the bandwagon last season as the team battled their way to become World Series Champs" added her voice with Rusty's. This project was done for songwriters across Texas. For anyone interested in purchasing the download of this song, click here.